Each year the University of Brighton give students and staff the opportunity to nominate colleagues and lecturers recognising them for their work with students. This year, we are proud to say that two of our Brighton Business School lecturers were given awards for their teaching excellence. Congratulations to all colleagues for their outstanding efforts which were recognised with this year’s Excellence in Facilitating and Empowering Learning Awards. These annual awards, organised by the university’s Centre for Learning and Teaching, celebrate outstanding contributions to student learning. Nominations were received from staff and students and reviewed by the university’s judging panel. The awards were announced at the Learning and Teaching Conference, which featured a packed programme with nearly 40 separate presentations and keynote speeches by Professor Debra Humphris (Vice-Chancellor), Professor Stephen Denyer (Pro-Vice-Chancellor Education and the Student Experience) and Professor Mick Healey. 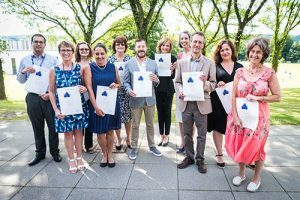 This year there were 14 awards, with a very strong field of final applications, all showing how committed our staff are to building on the quality and creativity of learning in the university. Rachel was nominated for being incredibly engaging – credible and approachable, as well as offering a huge level of valuable feedback. Julie was nominated for the range of activities she has implemented to reach students and develop their skills, through the time and energy she puts into improving their learning experience, and for maintaining contacts with alumni. Tagged awards, Teaching excellence. Bookmark the permalink.